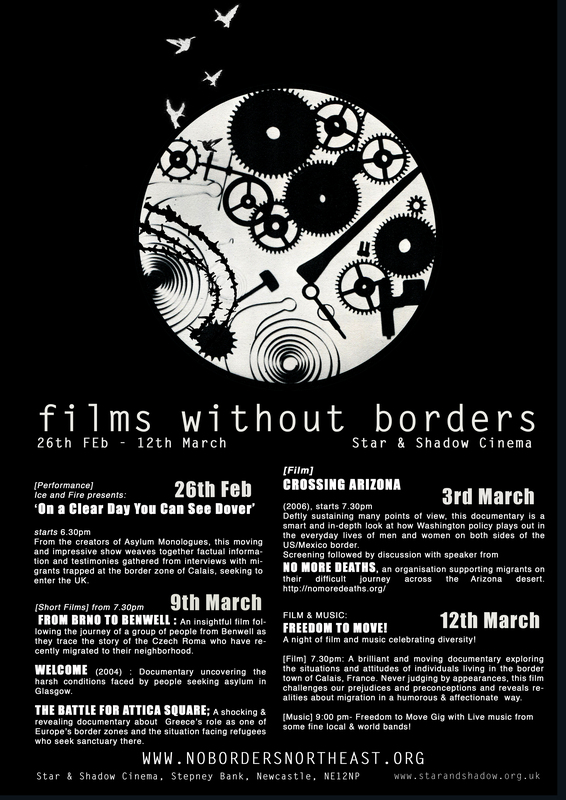 No Borders North East is hosting a season of events at the Star and Shadow Cinema, begining at the end of February. In this theatre performance, Ice and Fire theatre company weave together factual information and testimonies gathered from interviews with Calais migrants seeking to enter the UK. A moving and impressive dramatisation of the experiences of people in Calais. With Q & A with the director, and activists from Calais Migrant Solidarity who have recently visited Calais. Find out what you can do to get involved. Free. For more on the situation in Calais, see Calais Migrant Solidarity. Certificate n/a. Length: 96 mins. Language: English. Format: DVD. A collection of personal accounts of the experiences of people working around the Mexico / USA border. Screening followed by discussion with former “No More Deaths” volunteer and migrant rights advocate. Plus tasty Mexican food. Glasgow, Greece and Benwell, Newcastle. Followed by discussion. From Brno to Benwell – 21 minutes – 2007 Dir: Hugh Kelly – An insightful film following the journey of a group of people from Benwell, Newcastle, as they trace the story of the Czech Roma who have recently migrated to their neighbourhood. Welcome – 21 minutes – 2004 Dir: Camcorder Guerillas – Hundreds of refugees are being put out of their homes with no benefits and no rights to work. Unable to return to their countries they are in a stateless limbo on Glasgow’s streets. they would not allow it to happen”. This film was made to raise awareness about the issue of asylum seekers and refugees being made destitute and to give examples of what people can do about it. Attica Square – A shocking and revealing documentary about Greece’s role as one of Europe’s border zones and the situation facing refugees who seek sanctuary there. Brilliantand moving documentary exploring the situations and attitudes of individuals living in Calais. The intriguing and often funny characters are presented and surprising stories are revealed in light of their past experiences and their attitudes to migration. by a selection of the finest local and world bands!! !